Now that Intel has finally released the much anticipated Haswell Refresh K Series, also known as the Devil’s Canyon processors (Intel Core i7-4790K and Core i5-4690K), what’s next in Intel’s roadmap? 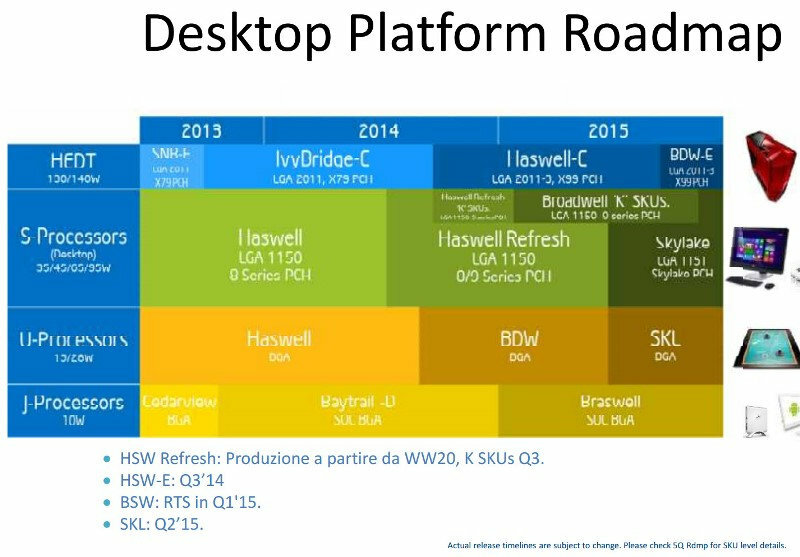 In the leaked Intel Desktop Platform Roadmap below, we should be expecting the Haswell-E processors for X99 system, 5th Generation Broadwell and Broadwell K processors, Intel Skylake and finally Broadwell-E by Q4 of 2015. Check out more details from the roadmap below. Based on the leaked roadmap, Intel will be releasing the first wave of 5th generation Broadwell processors towards the end of 2014. We will be first seeing Broadwell for mobile devices, followed by Broadwell for desktop and the Broadwell K series (unlock processors) towards the middle of 2015. Like the Haswell Refresh, the 5th Gen Broadwell processors are supported by the 9 series chipset and socket LGA 1150. During the recent Computex 2014, we have seen several X99 motherboards already, from MSI, ASRock and EVGA. This means that the successor of Ivy Bridge-E X79 platform is just around the corner. Based on the roadmap above, the Haswell-E processors will be released or revealed by Q3 of 2014. The Haswell-E will have a new type of socket, LGA2011-3, and will support Intel X99 Express Chipset, supporting the next generation DDR4 memory modules and other new technologies like USB 3.1 and more. The Haswell-E processors were already revealed recently. The series includes Intel Core i7-5960X, Core i7-5930K and Core i7-5820K. By second half of 2015, Intel will reveal probably the 6th Generation (if I am not mistaken) Intel Skylake processors. Skylake will have a new type of socket, LGA 115? (I’m not really sure with the last digit since the image is somewhat distorted) and will also probably support a new Intel Express Chipset. We probably won’t be seeing Skylake K series (unlock) by 2016 since Intel has the Broadwell-K series running throughout 2015. Hopefully, Skylake will support the new DDR4 memory for mainstream users. We might be seeing Skylake in Computex 2015 as well. Finally, Intel is planning to release the Broadwell-E, successor of Haswell-E, and will support the same X99 Chipset and same LGA 2011-3 socket. This means that users who bought an X99 motherboard and DDR4 memory (with a Haswell-E processor), can later upgrade to a Broadwell-E processor without the need to replace the entire system.